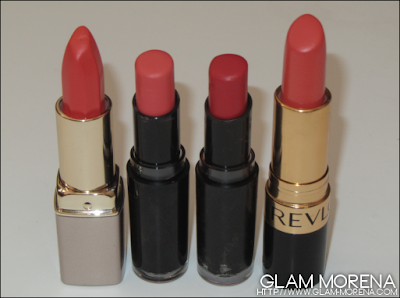 Glam Morena: My Favorite Orange Lipsticks. I think I'm on an orange kick right now! A few days ago I shared My Favorite Orange Blushes and now I'm going to be sharing My Favorite Orange Lipsticks. There are four shades that I'm mentioning and best of all they are all budget friendly. 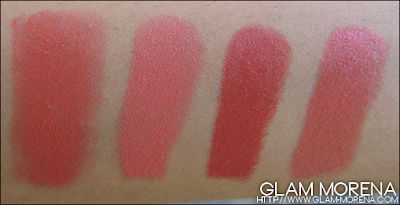 Be sure to watch the video for close ups of each lipstick and swatches! Swatches of all of the orange lipsticks. Lip swatches of all of the orange lipsticks. Are you a fan of wearing orange lipstick? Favorite shade(s)? Some of them are hard to tell the difference on your lips! I don't have any favorites - I don't think I could pull off a shade like that. If I did, it would probably be a gloss or sheerer tinted balm or something. Love the various shades of orange on you. I'm not sure my skin tone and orange go well together - but I may have to give it a try the next time I find a suitable shade. i like that they all look so creamy! I love the wet n wild carrot gold best!!! Its so pretty! Almost a peachy orange....sweet! Ps. Siren is my baby, i think thats the only orange that looks good. I have Mandarina and really want to try 24 Carrot gold... Your swatch looks really pretty!